A major Australian study has provided new insights into the loss of structure in regions of the brain and its potential association with Alzheimer’s Disease. The findings recently reported in Neurology suggest a build-up of deposits of the protein amyloid-beta in a region of the brain known as the temporal inferior cortex. The region is connected to the hippocampus, which is involved in memory. Alzheimer’s is characterised by two factors: a build-up of amyloid-beta plaques in the brain, and a loss of neurons. CSIRO’s Preventative Health Flagship Theme Leader, Dr Cassandra Szoeke, said the puzzle for researchers was that the parts of the brain that had shrunk (atrophied) due to neuron loss were not the same as those showing increased deposits of amyloid-beta. Using MRI scans to study Alzheimer's disease-affected brain tissue, the researchers found that shrinking (atrophy) of the hippocampus was associated with plaque deposits in the temporal inferior cortex. The results indicate that the increased accumulation of amyloid in the temporal inferior cortex disrupts connections with the hippocampus, causing the neurons to die. "By helping to better understand the mechanisms involved in the progression of the disease, the study may guide the development of new strategies for early diagnosis," Dr Szoeke said. 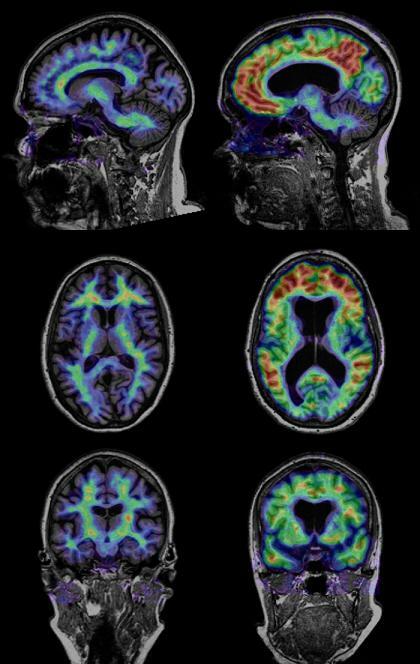 The study involved advanced techniques for analysing and comparing different types of brain scans. Lead researcher was Dr Perrick Bourgeat, from the Australian e-Health Research Centre - a joint venture between CSIRO and the Queensland Government.